I agree! I laughed out loud reading it and confused my roommate! I LOVE this idea. I’ve been making frozen coffee “ice-cubes”, but this might just be an even better idea!! Pinning this one for sure! I could just pour my espresso shots over the top of these, and have my cold summer breakfast drink!! Another reason I can’t wait for summer! Can you use Splenda or another sugar substitute? I haven’t done it myself, but I think it would work. I just discovered your blog and LOVE IT! I also love the idea of vanilla ice! I’ll definitely be trying this. 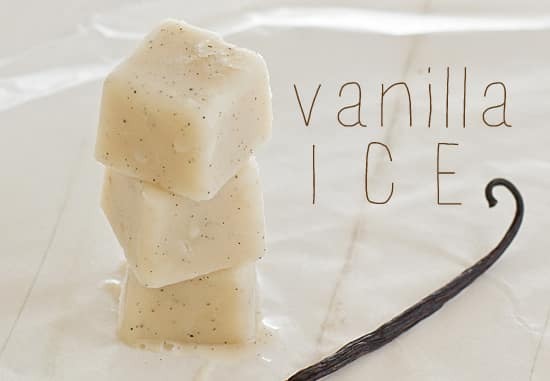 Could you put vanilla bean ice cream into a blender and then pour back into ice cube trays? I haven’t tried it myself, but I did have someone else comment and say he made them that way and they turned out well. These were quite tasty! Though I will note that when tested in iced tea, mine only stayed afloat for a few seconds, before sinking to the bottom. Much like Vanilla Ice’s career. I really want to try these! One question bough. If I don’t have vanilla bean, can I just add more vanilla extract? I haven’t made this with vanilla extract instead of vanilla beans, so I can’t say. I’d do it by taste–start with a teaspoon and add more vanilla extract a half teaspoon at a time until it tastes right. OK so I made some of these last night with almond milk. I used probably about 2.5 tsp of vanilla extract and it was pretty vanilla-y. Honestly probably could have used a little less. I had a bit of a problem though. I used a few cubes in my coffee this morning, but found that as the cubes melted, the Almond milk seperated. There were a bunch of little “floaties” in my coffee. After some research, I discovered that this is pretty normal after freezing almond milk, and it’s not curdling, it’s just the almond powder separating out of the water, basically. It doesn’t change the nutrition or anything, just looks a little funky and might alter the taste a bit. I was wondering, have you had this problem at all? If not, I wonder what you’re doing differently. Maybe the particular brand of almond milk you’re using? The last few times I’ve made these, I’ve used refrigerated coconut milk, but even when I used almond milk, I didn’t have problems with separation. As I mentioned in the post, the ice cubes don’t melt completely smooth, but after stirring, things distribute evenly for me. I’ve heard from people who have no problems with this recipe and I’ve heard from others who have that curdling/separation, and I really can’t say why it works for some people and not others. I love using vanilla beans…they add so much more flavor than vanilla extract….but they are so expensive. But I found a wonderful website that sales them for super cheap and they are AMAZING!!!! http://www.indrivanilla.com I used to feel guilty using vanilla beans and would save them only for the most special times, but now I don’t feel like I am breaking the bank to treat myself to something nice. Thanks for the suggestion! I feel the same way about using vanilla beans. 🙂 But they are worth it! Would regular 2% dairy milk alter the end product? I haven’t tried it myself so I can’t say for sure, but I know other people have used dairy milk and the recipe turned out for them. I’m obsessed with vanilla beans so naturally, I LOVE this. Now all I can think about are layered flavor cubes … coffee on the bottom w/ this vanilla deliciousness on top! I have been hoarding my last few vanilla beans but now I know exactly what I’m going to do with them. This sounds good except you’re not supposed to freeze almond milk. It’s perfectly safe to freeze almond milk and it doesn’t alter the taste either. Sometimes almond milk separates after thawing, but stirring remedies that. Could these be made with cow’s milk? I haven’t tried it myself, but other readers have and I’ve heard it works well.